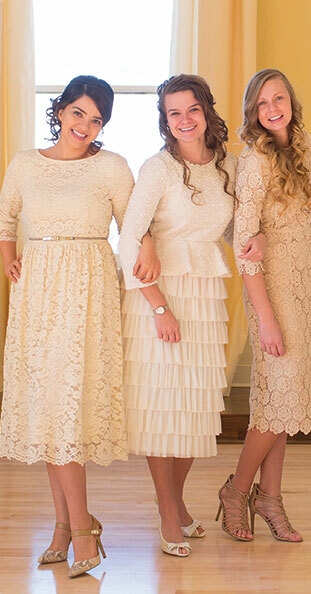 -- Please Choose an Option --	SHORT LENGTH 42-1/2" - 44" LONG LENGTH 52" - 55"
Can someone say "belle of the ball"? We think we've perhaps never seen a vintage dress that exudes elegance so much as this one. Made of the most beautiful crepe fabric and lace, this lovely piece moves and feels like a blissful dream. Wear it to any special occasion you have coming up; you'll feel like a million bucks! Black at the waist is always a good idea, and personalizing this modest dress with your style is a cinch. Accessorize with solid colors or leopard print . . . So many options! Back closure features a single button over a small, modest opening. Choose from adorable knee length or elegant maxi length in this flattering dress. Model in short version wears Dainty Jewell's size medium. Model in long version wears Dainty Jewell's size large. This dress is so beautiful!! I bought it because it was super cute and also for my bridal shower and my wedding rehearsal. So far I wore it to my bridal shower and I got compliments and I felt very comfortable and also very stylish!! I purchased the shorter length dress and it's awesome because it will look cute with flats or with heels!! !